Above-inflation yields have declined sharply, but still remain "relatively" attractive compared to those of the last 10 years. A lot has changed since December, when I declared that month's five-year TIPS reopening auction "a screaming buy." That auction generated a real yield of 1.129%, the highest for any auction for this term since April 2009. The screaming is over, folks. In just four months, real yields (meaning yields above inflation) have declined sharply. The U.S. Treasury on Friday estimated that a full-term five-year TIPS would have a real yield of 0.52%, down a remarkable 61 basis points since that December auction. Thursday, the Treasury is creating a new five-year Treasury Inflation-Protected Security, CUSIP 9128286N5, in a $17 billion offering. A TIPS investment carries a coupon rate, which is determined by the originating auction. That coupon rate confuses some investors because it is lower than that of a comparable nominal Treasury. However, with a TIPS, principal balances are adjusted higher or lower each month to reflect U.S. inflation. The "real yield to maturity" is also set by the auction, and reflects the investors' actual return above inflation. The real yield at an originating auction will always be slightly higher than the coupon rate. While the recent decline in real yields is disappointing, a coupon rate of 0.50% would still be relatively attractive. A year ago, on April 19, 2018, a five-year TIPS generated a real yield of 0.631% and a coupon rate of 0.625%. But before that, there were 21 consecutive four- to five-year TIPS auctions with a coupon rate of 0.125%, the lowest the Treasury will go. That string dates all the way back to April 2011. If you believe the U.S. economy is shaky and the Federal Reserve will soon begin cutting interest rates and other extraordinary measures, then this new five-year TIPS qualifies as a "buy." We may not see real yields at this level again for a long time. It's a hard call, but this TIPS will probably end up being a decent five-year investment, nevertheless. Getting a return 0.5% above inflation means - in most cases - your investment will at least match inflation, even after federal taxes. With a nominal five-year Treasury now yielding 2.38%, the five-year inflation breakeven rate is currently 1.85%, 34 basis points higher than the result generated at the December reopening auction. This means a five-year TIPS will outperform a nominal Treasury of the same term if inflation averages higher than 1.85% over the next five years. In my opinion, 1.85% is "fair value," meaning that TIPS aren't cheap or expensive versus nominal Treasurys. Over the last five years, inflation has averaged just 1.5%. Over the last 10 years, 1.8%. You can do better than 2.38% nominal for an insured five-year investment by investing in bank CDs. "Best in nation" rates for five-year CDs are currently running at about 3.1%, which pushes the inflation breakeven rate out to almost 2.6%. I'd say that bank CDs are the more attractive option right now, but your investment will be subject to state income taxes. 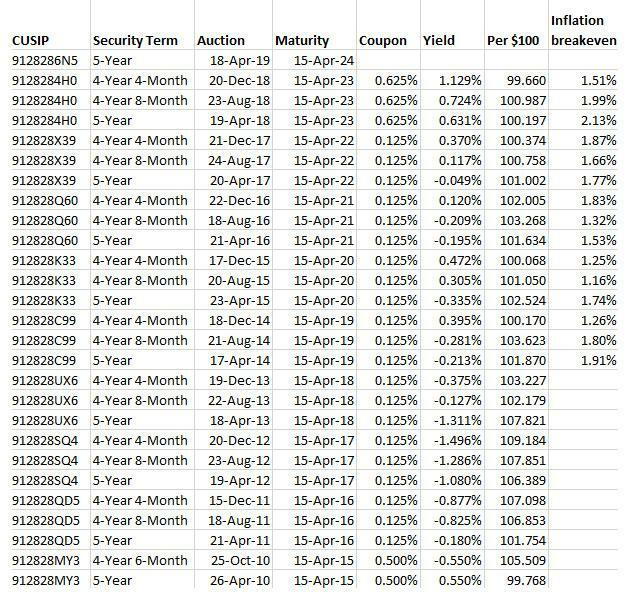 If you purchase U.S. Series I Savings Bonds before May 1, you can capture the current fixed rate of 0.50%, very close to the likely real yield of this new TIPS. When an I Bond carries a yield equal to - or higher - than that of a five-year TIPS, the I Bond is the preferred investment. I Bonds have several advantages over TIPS: a flexible maturity, tax-deferred interest, complete compounding of interest and much better deflation protection. So when their real yields are equal, buy I Bonds. I Bond purchases, through TreasuryDirect, are limited to $10,000 per person per year. I have been urging investors to buy before May 1, because I believe the Treasury will lower the permanent fixed rate on that date. Purchases before May 1 will retain the 0.5% fixed rate until they are redeemed, or mature in 30 years. Here's my analysis on the fixed rate. Yes or no on this five-year TIPS? I won't be a buyer, but I think it is a decent investment, especially for investors who are seeking inflation protection but have maxed out their I Bond purchases for the year. (I bought my allocation in March). Bank CDs paying above 3% remain an attractive alternative, especially in this time of muted inflation. I will be reporting the auction's results Thursday after the close at 1 p.m. EDT. If you want to track real yield estimates this week, check the Treasury's Real Yields page each afternoon after the market's close. Additional disclosure: David Enna is a financial journalist, not a financial adviser. He is not selling or profiting from any investment discussed. The investments he recommends can purchased through the Treasury or other providers without fees, commissions or carrying charges.